The book, "Tattoos on the Heart" by Father Gregory Boyle is an honest, unflinching description of what life is like for gang members, not just in Los Angeles, but across our country. Often uneducated, from broken homes, and suffering from drug addictions, these gang members still sometimes struggle to rise above their circumstances to be better than anyone might expect. The love and acceptance that Father Gregory shows them gives these gang members hope and inspiration. The jobs he provides help many of them find a way out of the gang life. Father Gregory is a Jesuit priest who, in 1988, founded the institution which eventually became known as Homeboy Industries, a gang intervention program in the Boyle Heights area of Los Angeles. He has served members of at least half of the 1100+ gangs in Los AngelesCounty, helped them find jobs, gotten their tattoos removed and taught them to work together. There are dozens of individual stories revealed in this book. I'll mention just two. There is the story of Bandit who, 15 years after finally leaving the gang life behind, returns to Dolores Mission, Father Gregory's church, because Bandit wants his daughter to receive Father Gregory's blessing before she goes off to college … to study forensic psychology and the criminal mind! They joke that her father will be her first subject! And then there is the story of Chico who asks Father Gregory to find him a job where he will learn about computers. The priest finds him such a job, and Chico loves it. Only two months later, he is gunned down near his front porch. The laughter and joy of Bandit's family are followed within pages by the haunting description of Father Gregory's personal despair over Chico's death. Success? Failure? Father Gregory makes us wonder how we can measure either. These outcomes were far different, but wasn't the help he gave both Bandit and Chico equally valuable? If you are interested in purchasing this book and supporting this worthwhile and successful gang intervention program, use this direct link to "Tattoos on the Heart: The Power of Boundless Compassion" on Amazon.com. 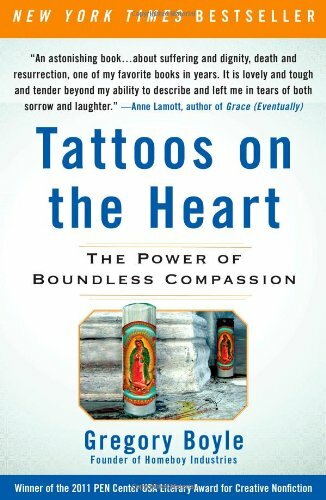 "Tattoos on the Heart" by Father Gregory Boyle who founded Homeboy Industries, goes into great detail in describing the L.A. gangs and the gang intervention program that he founded. It is one of the most touching books I have ever read. It is subtitled "The Power of Boundless Compassion," which aptly summarizes the stories of hope and loss that the author shares with his readers. My favorite message, and there are many, is when he quotes Leon Dufour, a Jesuit theologian, who says "God is the person you're talking to, the one right in front of you." Father Gregory finds many opportunities to see God in the lives of these gang members, in their delight at the birth of a child, and their awe when an owl lands on the roof of one of the neighborhood housing projects ... some of the more charming events described in this book. These are the true stories of the lives of numerous gang members in Los Angeles. At times their stories are heart-rending and they made me cry. However, these stories also touched me in such profound ways that the catharsis of my tears was the emotional price I paid for seeing these gang members, who live less than an hour's drive from my Orange County home, in a new and different light. However, the stories may be too poignant for young people or even adults who are especially sensitive. Despite the realistic depiction of these broken members of our society, I found this book to be one of the most inspiring collection of stories I have ever read. There were parts that made me laugh until tears came to my eyes, and other parts that brought tears of sadness. The book is thought-provoking, but also inspires us to treat others as equals, regardless of their background. After all, sometimes we really can see God in the person in front of us, the person we are talking to right now. A final note, Father Boyle is donating all his net proceeds from this book to Homeboy Industries. Simply by purchasing a copy of the book, in any format, you are helping his gang intervention ministry. There are probably few better ways you could spend $10 to $15 than to get this wonderful book and support a successful gang intervention program at the same time. Click on the blue title and you will be taken to the Amazon website where you can choose the version that appeals to you ... Kindle, print or audio. These stories obviously had a huge impact on you. What better recommendation for a book. Sounds like one I'd like to read. Thanks! This is a great book, and one that I hope people will tell their friends about. Homeboy Industries has lost a lot of their state anti-gang funding because of California's budget problems, and the proceeds from the sale of the book, "Tattoos on the Heart," are important to the survival of the organization. Please pass this information on. Thanks! Thank you for a very interesting review of Tattoos on the Heart by Gregory Boyle. My Dad was also telling me about this book. Good review. I am going to need to get this out of the library. I hope you do have the opportunity to read it. I think it is a life-changing book. For the first time in my life I saw gang members as people, rather than they way they are depicted in movies. One of my friends recently visited Homeboy Industries, and she was so impressed with their operation! This is the story of the gangs of Los Angeles and how one priest has changed the lives of thousands of gang members.